MINI HANDHELD PORTABLE MISTING FAN - Multifunctional personal fan, rechargeable USB mini cooling fan and beauty humidifier 2 in 1. 3 Modes of Wind Speed:Low, medium, or high.2 Modes of Spray:Continuous or intermittent. PORTABLE AND 180 DEGREE FOLDABLE - This fordable handheld humidifier fan is not only used as a desktop fan after folding, but also be a handheld fan and easy carrying in the bag.Very suitable for outdoor activity and home or office.Keep you cooling anytime. RECHARGEABLE BATTERY AND USB PORT - USB rechargeable mist fan built-in rechargeable battery with a USB port, you don\'t need to spend much on batteries. One full charge can be used for a long time up to 2-8 hours depending on different wind speed, and the humidifier fan can also be used while charged. STRONG WIND AND SOFT MIST- Our fans adopt advanced technology, wind power is stronger than other handheld fans,Spray mist with 35ml water capacity, It can keep the face or skin moist and refreshing at office, bedroom or travel and outdoor. 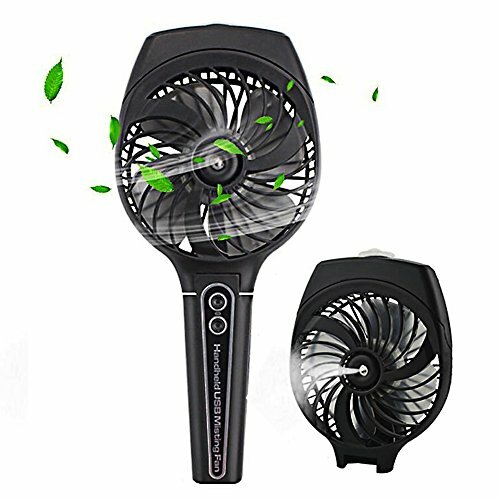 MULTIFUNCTIONAL FAN - Indoor desktop fan and outdoor portable fan.Foldable handle design, convenient to hold in hand, and also fits your handbag with its palm-size. Or just fold the handle and put on the desk.